In the first year after THRIVE came out, Kimberly and I visited over forty cities around the world with screenings and solutions workshops. We noticed that virtually all of the communities had people working on important issues, but they weren’t in touch with, or even aware of, others addressing the same problems. Imagine if all the data that was used to generate a successful ban of GMOs was easily available for anyone working on the issue? What if a successful lawsuit filed in one state was available as a template for others to use? This kind of efficiency in collaboration can catapult our efforts so that they truly can be commensurate with the challenges we face. So we created a Solutions Hub on our website to facilitate people finding each other by issue, zip code or Sector, and then sharing best practices and resources with one another. And it’s happening! And there are significant milestones to celebrate! Just as we passed the milestone of 24 million official views of the movie, the 1,000th Solutions Group was self-created! 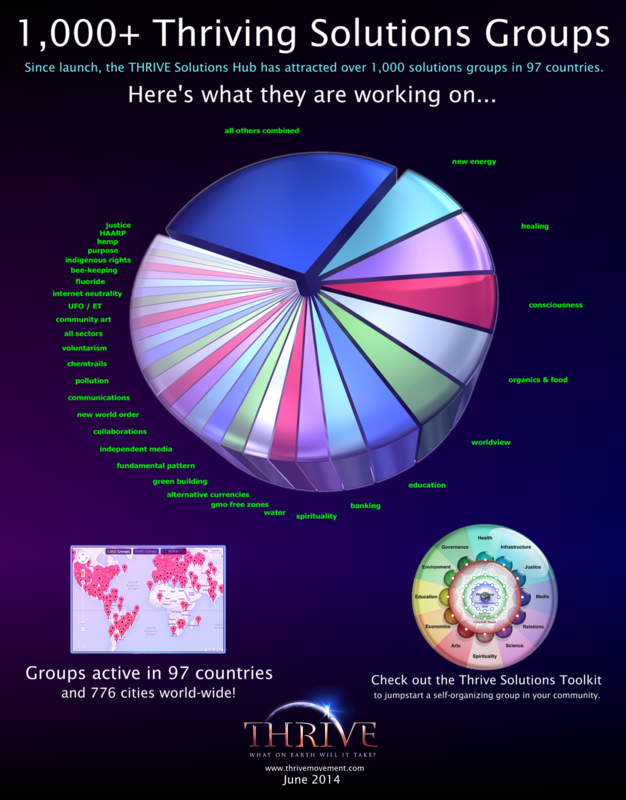 Now, Thrive groups are in 97 countries. They are working on over 300 different issues, covering all twelve Sectors. The very first group to register, back at the end of May in 2012, was the Los Angeles SoCal Solutions Hub, currently with 36 members. The 1,000th group is Thrive Torbay Devon. They have an organic food coop and are starting an anti GMO / fracking environment group. What do these 1,000+ groups have in common? They are comprised of individuals who are mature enough to face uncomfortable truths, to think critically, to honor the emotional aspect of their process…and then to stand up, speak up and link up with others in taking action. Here are a few examples… 106 groups are working on labeling or banning GMO crops; 71 include exposing and stopping chemtrails on their agenda; 141 are tackling banking schemes and working on alternative currencies; 193 are promoting organic growing & sustainable food production; 164 are helping to transform education. Thrive Movement has never been about building a big global organization or micro-managing individual initiative. It’s about empowering and connecting de-centralized, self-creating movements whose solutions strategies are based on principles, not politics. And those principles are most simply Integrity and Non-violation. 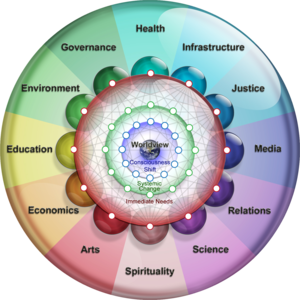 If you use a “Sector” strategy, use the same titles we use, so that we can coordinate and amplify all our efforts world-wide. These titles were worked out over a decade with close to a dozen different groups. Solutions strategies and tactics in the Thrive network need to create no new violations. 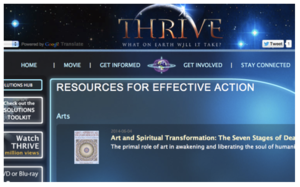 One of our top-priorities for Thrive Movement is to raise our on-line Solutions Hub site to a whole new level of effectiveness. We have already outlined the specifications for its improved function and look forward to making learning, connecting and succeeding even easier. THRIVE came out dubbed in 10 languages and has been subtitled in 15 other languages by fans from around the world. 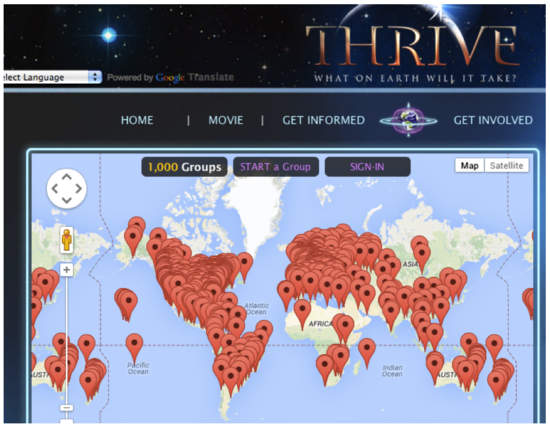 We always envisioned that the THRIVE movie would be like a “trailer” for the website. 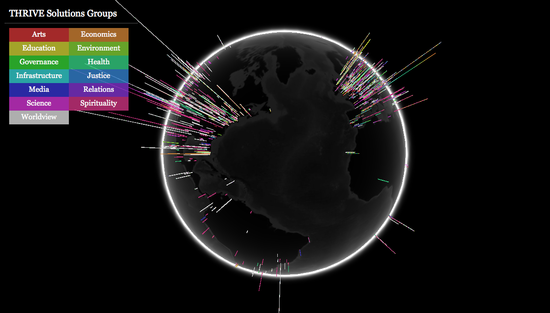 And the website was created as a toolkit for the movement. Now, we are grateful to see that it’s happening! For those already participating, we sincerely thank you for your hard work and inspiration. For those wondering how you can best contribute during these challenging times, we welcome your enthusiastic and innovative participation. You can start a group or search for one by region, Sector or issue. Anyone working on an issue, please share what you are learning with the rest of the network, whether it’s a petition, a poster designed to gather people, data, experiences of success or failure, or other creative methods. If you are a member of a group, you can post resources directly to your group’s activity page. if you are a group coordinator, be sure to re-post the most effective resources to the THRIVE Solutions Group Coordinators Page so that you can empower others to learn from your work and experience, as you benefit from theirs. We regularly take your suggestions to update our Resources for Effective Action, which are categorized by Sector. Our Solutions Toolkit can be easily downloaded and operates as a handbook for effective activism. We will also be creating an app and making this easier in the coming year. Meanwhile, this Toolkit has organizational ideas and decision making procedures that can help make the work of social and environmental change more successful. Another critical element that can undermine successful activism is interpersonal conflict. For 15 years, I was a conflict resolution facilitator and communication/team building trainer for companies in Silicon Valley as well as for sports teams, law firms, families and schools. 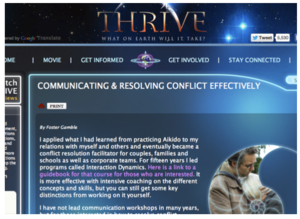 My communications guidebook — Interaction Dynamics — which I used for my trainings, is also available on the Solutions Hub. Feel free to join us in spreading dynamic and effective solutioning across our dear Planet Earth.